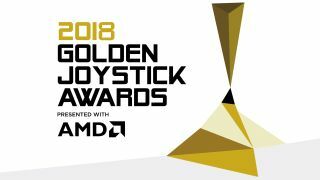 Voting is now live for the 36th Golden Joystick Awards presented with AMD, meaning anyone and everyone can help decide the victors of the annual video game awards show taking place at London's Bloomsbury Big Top on Friday, November 16. You can head to www.goldenjoysticks.com right now to cast votes in 16 different categories, including ‘Most Wanted Game’, ‘eSports Game of the Year’, ‘Best Competitive Game', and more. As if it wasn't incentive enough to have your say in one of the biggest game award ceremonies of the year, every voter will receive a free digital ebook that's normally worth up to £15.99. The Golden Joysticks are also doing something new for 2018, holding a one-week only voting window for the 'Ultimate Game of the Year' category, which runs at the end of general voting period from October 26 to November 2. This'll allow you to pick your personal GOTY having had the chance to play some of 2018's biggest upcoming games, such as Red Dead Redemption 2 and Assassin's Creed Odyssey. Pretty handy, right? The full list of award categories is outlined below, but be sure to follow the Golden Joysticks Twitter and Facebook accounts for more news and updates as they arrive over the coming weeks and months. Current frontrunners in the 2018 Golden Joystick Awards include God of War and Gorogoa, each with four nominations in different categories, while both Subnautica and Monster Hunter: World follow with a no less impressive count of three nominations. That said, it all falls down to the public as to who goes home with a trophy in hand, so make sure you make yourself heard before voting closes for good on November 2. If you need a refresher on the best games of 2018 so far, check out our list for some of the current favourites and GOTY contenders across all platforms.